Gov. 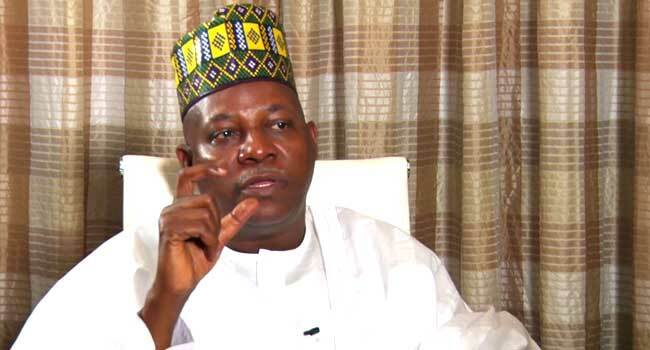 Kashim Shettima of Borno State on Wednesday urged All Progressives Congress (APC) members aggrieved over outcome of the primary elections to emulate Gov. Akinwunmi Ambode of Lagos State, who let go, demonstrating a spirit of sportsmanship. Shettima spoke in Lagos when he, alongside Ambode, led the APC National Peace and Reconciliation Committee, Southwest, to meet with and pacify aggrieved party members from Ogun and Lagos State, still unhappy with the outcome of their primaries. The Borno State governor, who chaired the meeting held at the Government House, Marina alongside Ambode, urged aggrieved members to allow party decisions override their personal interests. Recall that Ambode had initially taken a tough stance during the governorship primary in Lagos State when party leaders endorsed his opponent, Mr Jide Sanwoolu, but later bowed to the will of the party when he lost the ticket to the latter. Shettima said that Ambode had shown loyalty and demonstrated courage in the way he handled the outcome of the party’s primaries in Lagos State, urging those still aggrieved to follow his example. He said:”I know many of you are not satisfied with the outcome of the primary, but we need to understand that party primaries has its own peculiarities. “So, we must fight out instinct and work for the wider future. “We need to understand that politics comes with unpredictable outcomes. “Anyone who is aggrieved should take a cue from Ambode who has demonstrated high political maturity. Shettima said politics required tolerance and compromise, and what any political party could do wrong was to take loyalty and tolerance of party members for granted. He noted that the committee was set up primarily to look into possible ways that could be recommended to the party to address needs of aggrieved members in the party. “We understand that you are all men of honour and integrity and you all are leaders with mass followership in your respective domains. “It will be grave for any party to ignore you all and take your loyalty for granted because loyalty begets loyalty. “Winning next year’s election requires collective efforts. “Politics requires pragmatism and what we need from everyone is to be able to deliver the needed result. We must be able to dance to the changing needs,” he said. Shettima said the Committee would forward its observations and solutions to the National Working Committee (NWC) of the party for appropriate action, while urging aggrieved aspirants to exercise patience. He said that the party would do everything possible to address their grievances. “Definitely, the NWC will take far-reaching decisions to ensure that we have come on board to achieve our dream of winning the 2019 elections. “Everyone is important in this movement and we are not going to underrate anyone,” Shettima said. Also speaking, Ambode who is also a member of the committee, noted that members in Lagos are one family, but would work to ensure that there is peace in Ogun,which had its effect on the Southwest at large. “We can say affirmatively as a party in Lagos State, we are one family. That is not taking lightly whatever is happening in Ogun state, but very clearly, things are not in Ogun state like we have in Lagos. “That is why this committee is more or less anxious to see whatever it is we can put as the best in creating peace. “Whatever happens in Ogun is reflection of what is happening in the whole of the southwest and we are ready to make sure that we bring everybody into one family. According to Ambode, the ultimate is to win the 2019 elections for the party, hence the need to move from reconciliation to compensation. Many party chieftains from Lagos and Ogun were part of the meeting. The News Agency of Nigeria (NAN) reports that the committee had earlier met party members in Ado-Ekiti, Ekiti and Ibadan, Oyo State.